Earlier this month, we reported that scientists were making strides towards treating Crohn’s disease. That research, from the University of British Columbia, revealed the genetic cause of fibrosis, one of the disease’s primary symptoms. Now, researchers from Case Western Reserve University may have discovered the key factor behind the development of the disease as a whole. They found that a fungus present in the intestines plays a major role in whether or not a person develops Crohn’s – proving the association by connecting it to bacteria that have already been associated with the disease. The finding is potentially groundbreaking and could lead to new treatments for the inflammatory bowel disease. In a best-case scenario, researchers could eventually develop a cure for Crohn’s using the information that was gathered. The researchers came to their conclusions after studying the fungal and bacteria cultures in Crohn’s patients and their first-degree relatives in northern France and Belgium. They found that the relationship between two bacteria and one fungus was very close and prominent in Crohn’s patients, whereas the interaction and number of them in healthy family members was much lower. After further testing, Ghannoum and his colleagues discovered that the three microorganisms actually worked together to create a biofilm that coated part of the intestines. This biofilm was found to prompt inflammation, which is a primary symptom of Crohn’s disease. "Among hundreds of bacterial and fungal species inhabiting the intestines, it is telling that the three we identified were so highly correlated in Crohn's patients. Furthermore, we found strong similarities in what may be called the 'gut profiles' of the Crohn's-affected families, which were strikingly different from the Crohn's-free families,” said Ghannoum. Still, the team does have some optimism that their findings will be put to good use in the future. 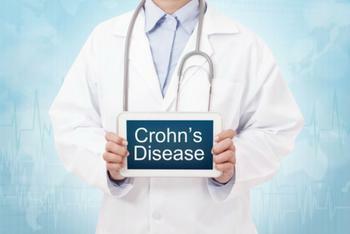 “Our study adds significant new information to understanding why some people develop Crohn's disease. Equally important, it can result in a new generation of treatments, including medications and probiotics, which hold the potential for making qualitative and quantitative differences in the lives of people suffering from Crohn's."